On the same day it emerged that Mayor Hubris was spending up to £150m (and counting …) of OUR MONEY on a series of pet commercial development projects around Temple Meads, he published a CRAZED ARTICLE on posh people’s website, the Huffington Post, explaining how he was tackling inequality in Bristol. “We are targeting investment in the most highly deprived areas,” blustered the old fool. Although capital investment by the council in deprived areas such as Avonmouth, Hartcliffe and Southmead is NON EXISTENT. While basic public services run by the council in these areas such as youth, housing and libraries have been consistently CUT by Mayor Deluded. Even a proposed HARTCLIFFE RECYCLING CENTRE, a useful public service and a source of employment in a deprived area, has been on the backburner because George alleges he can’t find the £3m necessary to open it. So is a polluted old diesel yard next to Temple Meads Station – the subject of about £130m of council investment so far for an arena – one of these “most HIGHLY DEPRIVED AREAS” then? Other “MOST HIGHLY DEPRIVED AREAS” – all conveniently situated around Temple Meads and worthy of the mayor’s energies and lots of our cash – include the City Point office building directly opposite the station purchased with £9m of our money; derelict land at Temple Meads owned by Skanska and subject to a SECRET financing deal with the mayor and the George Hotel site at Temple Gate, which Mayor Moneybags wants to purchase for an UNDISCLOSED FEE amounting to millions in public money. Or how about an uncosted eight-storey car park on the Bath Road being built entirely for the benefit of the “most highly deprived” ARENA OPERATORS? Or the former Post Office site at Temple Meads, which George is fattening up for sale in the hope it will pay for some of his over budget arena? Try to find similar financial commitments in any of Bristol’s REALLY deprived areas and there’s none. Quite the reverse. 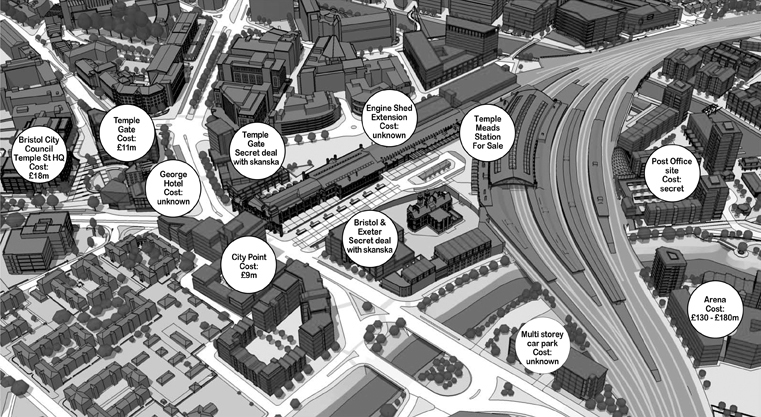 Deprived areas are subsidising commercial property developments at Temple Meads on an epic scale. Instead, as George explains in the Huffington Post, he’s tackling any genuine inequality and deprivation with a bunch of CHEAP, INADEQUATE AND LAUGHABLE policies. Any old policy pursued by George over the last three years has been hastily assembled into a list by a council PR and then abstractly rebranded as an anti-poverty measure. “From 20mph, to RPZ, to metrobus, to engagement hubs, to 10,000 new primary school places, to children planting 30,000 trees, to a rainbow cabinet – all these are integral evidence-based policies that help secure a foundation to position Bristol to sustainability and fiercely tackle inequality,” waffles Mayor Gonad. Really? Reducing traffic speed tackles poverty and inequality? Likewise, surely even the most DEMENTED of hippies is unlikely to claim children planting trees is a realistic solution to poverty and deprivation? We could just conclude, at this point, that our mayor is a crackpot in need of a long lie down but anyone who thinks providing deprived areas with a few road signs and a tree planting project for kids counts as serious investment while simultaneously funnelling HUNDREDS OF MILLIONS to corporate property interests is clearly mendacious. Vote him out in May. This entry was posted in Diggers & Dumpers, News and tagged Arena, Arena Island, Bristol & Exeter, Bristol City Council, City Point, Deprivation, Diesel yard, George Ferguson, George Hotel, Hartcliffe Recycling Centre, Huffington Post, Regeneration, Skanska, Temple Gate, Temple Meads, Temple Street on March 16, 2016 by thebristolblogger.